The NHL has been very happy with their Global Series efforts in recent seasons and very motivated to continue their preseason and regular season ventures in countries throughout Europe and Asia. As early as November, Prague – the capital of the Czech Republic, a major supplier of hockey talent – emerged as a likely destination for a Global Series event next season. Per Sportsnet’s John Shannon, that has now been confirmed and the competitors have been chosen. The Chicago Blackhawks and Philadelphia Flyers will start the 2019-20 season in Prague. If the 2018-19 format is to be followed , the Blackhawks and Flyers are likely to play just the regular season opener overseas. This season, the New Jersey Devils and Edmonton Oilers started the year with a game in Sweden, which was preceded by exhibition contests elsewhere in Europe. However, in November the Florida Panthers and Winnipeg Jets faced off in a pair of games in Finland, so it could be that the league opts to schedule two matches in the Czech Republic to open the season. All of the Global Series games had great success this year, which could encourage the league to expand on the total number of contests. Also like the Global Series competitors this season, Chicago and Philadelphia have ties to the location. While the Blackhawks and Flyers are undoubtedly teams that the NHL likes to promote in league events, they also each have popular players among Czech fans. Jakub Voracek, long-time Flyers star forward, is one of the more popular Czech players in the NHL, while teammate Radko Gudas is a Prague native. Meanwhile, the ’Hawks have several intriguing young players with Czech connections. Standout rookie Dominik Kahun has both Czech and German citizenship, second-year player David Kampf came over directly from the top Czech pro league, and NLA superstar and Czech native Dominik Kubalik was recently acquired from the Los Angeles Kings and Chicago could push to sign him this summer. The game would garner great attention in a great hockey country like the Czech Republic regardless, but with several locals to watch it should be a quite popular event. The Los Angeles Kings have already traded one veteran defenseman, and now they’re going to sit down another. Dion Phaneuf is expected to be a healthy scratch for the Kings tonight when they take on the Philadelphia Flyers, a move that isn’t totally surprising given the role he’s played this season. Phaneuf has seen more than 17 minutes of ice time just four times this season, and not since early November. After this season the 33-year old has two years remaining on the massive seven-year, $49MM contract he signed with the Toronto Maple Leafs in 2013 and could be headed towards a buyout in the summer. While the result of a buyout wouldn’t be outstanding for the Kings, having Phaneuf on the roster isn’t helping them much at this point and they have younger players who would benefit from that opportunity. The Ottawa Senators, who retained a portion of Phaneuf’s contract when they traded him to the Kings, would still be responsible for 25% of the salary and cap hit from a buyout. David Kampf will be out of the Chicago Blackhawks lineup for up to a month with a foot injury, the team announced today. Kampf is a restricted free agent at the end of the year and has done enough to show he deserves another contract with the team, but a month off will certainly hurt his negotiating leverage. The 24-year old forward has 16 points in 50 games but is a solid enough depth option down the middle. After a brief conditioning stint in the minor leagues, Michael Rasmussen is expected to be back in the lineup tonight for the Detroit Red Wings. The big center scored twice in three games for the Grand Rapids Griffins, and will look to continue his offensive development in the second half of the season in Detroit. A huge part of their future, the 6’6″ forward had just 13 points in his first 41 games. Playing in the NHL at 19 is an accomplishment in itself, but the team will need more scoring from him going forward. With the Eastern Conference still undecided until today’s final regular season game, the Western Conference has no questions as the Colorado Avalanche finished off the St. Louis Blues in a 5-2 victory Saturday as they clinched the final playoff spot. The Nashville Predators got the top spot and will face the Avalanche. In other first-round matchups, the Vegas Golden Knights will face the Los Angeles Kings, the Anaheim Ducks will face the San Jose Sharks and the Minnesota Wild will face the Winnipeg Jets. The New York Islanders announced they have assigned forward Tanner Fritz on loan to the Bridgeport Sound Tigers to help their AHL affiliate, who have four games left in their season. The 26-year-old Fritz split time between both teams, putting up three goals and seven points for the Islanders in 34 games, while scoring 10 goals and 27 assists in 33 games for Bridgeport. 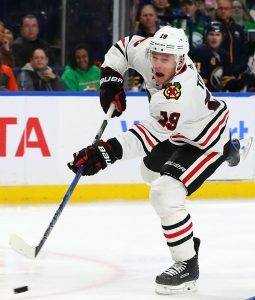 The Chicago Blackhawks announced they have assigned forwards John Hayden, David Kampf, Andreas Martinsen, Victor Ejdsell, Jeff Glass and Jean-Francois Berube to the Rockford IceHogs of the AHL for their playoff push. The Montreal Canadiens announced they have assigned forwards Michael McCarron and Kerby Rychel as well as defenseman Brett Lernout to the AHL’s Laval Rocket to get some more playing time in before their season ends. The Buffalo Sabres have announced they will send eight players to the Rochester Americans of the AHL for their playoff run, including forwards Nicholas Baptiste, Alexander Nylander and Kevin Porter; defensemen Brendan Guhle, Casey Nelson and Matt Tennyson; and goaltenders Linus Ullmark and Adam Wilcox. The Carolina Hurricanes have sent four players to the Charlotte Checkers of the AHL for their upcoming playoff run, according to the AHL team. The Hurricanes assigned forwards Nicolas Roy, Valentin Zykov as well as defensemen Haydn Fleury and Roland McKeown. It will be a change for Fleury who spent all but one game with Carolina this season, while Zykov put up solid numbers in the NHL with seven points in 10 games. With the Calgary Flames season over, the team has assigned three players to the Stockton Heat of the AHL to finish out their season. The team will return defenseman Rasmus Andersson, forward Spencer Foo and goaltender Jon Gillies. Andersson played 10 games for the Flames this year, while Foo scored two goals in four games. Gillies played 11 games for Calgary, putting up a 2.88 GAA. The Arizona Coyotes, according to CapFriendly, have sent four players back to the Tucson Roadrunners for their playoff run, including forward Dylan Strome and defensemen Dakota Mermis, Trevor Murphy and Joel Hanley. Strome showed some success at the NHL level, putting up four goals and nine points in 21 games this season. The Dallas Stars have joined the fray, reassigning defenseman Dillon Heatherington and goaltender Mike McKenna to the AHL’s Texas Stars as they continue their push toward the playoffs. The Chicago Blackhawks will begin a four-game road trip tomorrow night against the Vancouver Canucks, and they’ll have a new option up front should they need it. David Kampf has been recalled by the team from the minor leagues for the first time. Kampf signed with the Blackhawks in the offseason after a particularly impressive season in the Czech professional league, and has performed well in his first taste of the AHL. With 17 points in 30 games, the 22-year old has shown that his European breakout might lead to a real NHL future. The Blackhawks, still struggling to remain relevant in the Western Conference playoff race, could use some kind of spark to get them back on track. Undrafted, Kampf was a highly sought-after free agent this summer that eventually decided on the Blackhawks organization. The 6’0″ winger was actually ranked 36th among international skaters in 2014 and 57th again in 2015, but was never selected. He’ll now try to become the latest example of an undrafted European player making a big impact in Chicago. The team has also recalled goaltender Jeff Glass, while placing Corey Crawford on injured reserve. 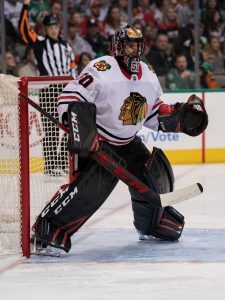 It’s not clear how long Crawford will be out, but the net will fall to Anton Forsberg for the time being. Glass, 32, has never appeared in an NHL game in his professional career. After his agent revealed that he was close to a decision last week, Jan Rutta is in the news again today. The Athletic’s Scott Powers reports that the Chicago Blackhawks are still in contention for the Czech defender following his excellent performance at the World Championships. Darren Dreger of TSN had previously reported that both Edmonton and Calgary were also in the mix for the 26-year old. It’s worthwhile to note that Rutta’s Czech teammate David Kampf has already signed with the Blackhawks, likely giving them a good understanding of what he can bring to the table after scouting him thoroughly this season. 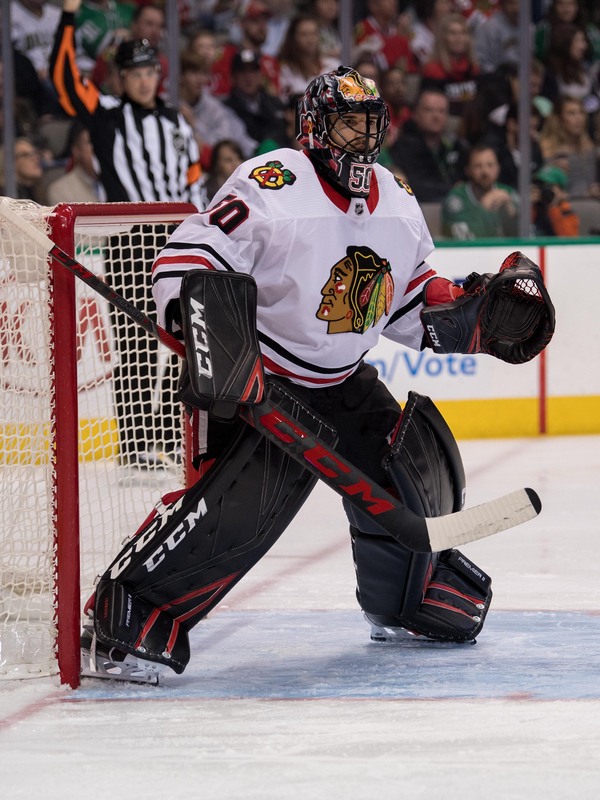 Where Rutta would fit into the Hawks’ defensive scheme going forward is unclear, though they will certainly need players on entry-level contracts to contribute this season as they are up against the cap again. With the team seemingly about to lose Trevor van Riemsdyk in the expansion draft, many have called to try and get Brent Seabrook to waive his no-movement clause and accept a trade somewhere. The team desperately needs the cap room, and could use players like Rutta or Ville Pokka—who needs a new deal himself—to fill the minutes on the blueline. As reported by Darren Dreger of TSN last week, the Chicago Blackhawks have officially signed David Kampf to a two-year contract. The entry-level deal will expire following the 2018-19 season, after which Kampf will be a restricted free agent. The 22-year old was one of the more dangerous offensive players in his native Czech Republic last season, and will be expected to carry some of that over to North America. After playing two full seasons without much offensive presence, Kampf broke out with 31 points in 52 games this season and immediately got the attention of NHL GMs. He provides NHL size and will be the next unheralded prospect that the Blackhawks try to turn into a legitimate role player. Kampf is not Artemi Panarin, but he could provide some depth on the wing for a team that relies on entry-level deals each year in order to afford their highly-paid core. With Panarin’s $6MM/year extension kicking in next season, it was crucial to find players like Kampf, John Hayden and Nick Schmaltz to fill in the roster gaps. While there is no guarantee Kampf will be able to provide anything in the NHL, he may even get a chance to try and show his effectiveness next to Jonathan Toews. If the Blackhawks intend to put the Panarin-Artem Anisimov–Patrick Kane line back together, they’ll still need to try and find full-time fits for Toews next season. Schmaltz, Hayden and Ryan Hartman have all taken turns trying to fill the hole that’s been left since Marian Hossa started his decline, and since the Hawks will struggle to afford Richard Panik’s next contract, both Toews-wings could be empty. On the heels of his report that the Maple Leafs had agreed to a deal with Swedish prospect Carl Grundstrom, Darren Dreger of TSN reports that the Chicago Blackhawks have inked their own European forward. David Kampf of Chomutov Pirati in the Czech league will sign a two-year entry-level deal with the Hawks soon. Kampf, 22, went undrafted before his breakout this season in the Czech league. The winger scored 15 goals and 31 points in 52 games, and has turned heads around the NHL. He was actually listed #36 among international skaters in 2014, but was never selected. His signing would add another young lottery ticket to the Hawks system as they continue to try and fill in the holes around their superstar core. The Hawks were also linked recently to Calle Rosen, another international free agent and have been in on many of the NCAA names this spring. With the team having so much money locked up in Jonathan Toews, Patrick Kane and others they have to use every avenue available to find talent. They’ve done an excellent job of it, integrating up to six rookies at times in their lineup this season but still coming out on top of the Western Conference.